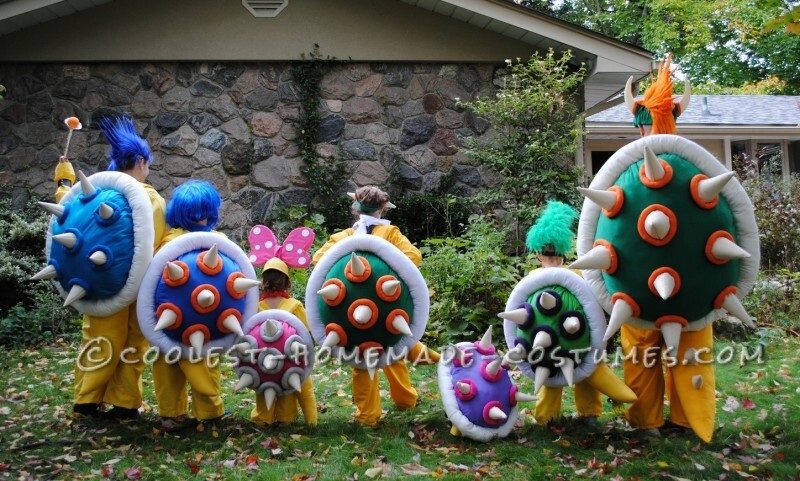 This year our kids decided they wanted to be Koopa characters from Super Mario Bros. Yay, another family theme was born! We decided on Bowser, Bowser Jr., Iggy, Larry, Wendy and Ludwig von Koopa. Our dog was forced to participate by wearing the costume, aka Roy Koopa, for a few minutes for pics. The dog was not amused, but hey, it’s once a year for a few minutes and nothing a few treats won’t make up for! These costumes took me about 3 weeks to make. It wasn’t too hard, just time consuming. 5 big bags of stuffing is what I used between the shells, spikes, circle around shell, tails etc. That is what cost the most, the stuffing, and then obviously fabric was another significant expense. The shells were made to be worn like backpacks. They’re not too heavy, just require a lot of room to store and transport, hence we took 2 cars wherever we went. Spikes are vinyl and were glued on with fabric glue and reinforced with thread/stitches. Completed the shell with rings around each spike in the appropriate color and the large white ring around the whole shell. The yellow overalls were easy and I didn’t spend much time on them. I did use the same vinyl for the front of our shells and the spikes, with just a little stuffing underneath. Kids got 2 piece costumes because that makes it easier to wear to school, and as such, I also attached the tail to very bottom of shirt so they can sit. The tails are also stitched just at the top portion of the tails, so they can be moved a bit off to the side without ripping fabric if you’re in the car and car seat etc. We added studs with hot glue to the black vinyl “leather” straps. Bowser himself had a viking helmet which was re-fitted to look the appropriate way. Iggy had over-sized sun glasses with lenses removed and a stuffed leg warmer for hair. Ludwig had 2 dollar store wigs attached for volume. What else? Oh, wands were just a wood stick with paper cutout covered with aluminum foil and Styrofoam ball colored and then sprayed with sparkling hair spray for glowing effect. You’ll obviously need a sewing machine for this project and a thimble for when you’re doing things by hand with the vinyl. That and lots and lots of yellow fabric. And lot and lots and lots of stuffing, preferably not the clumpy, heavy kind. We had a blast walking about! Bumped into a few friends and enemies from the Super Mario Bros series, tried to “capture” Princess Peach and gave a few Marios a friendly scare. 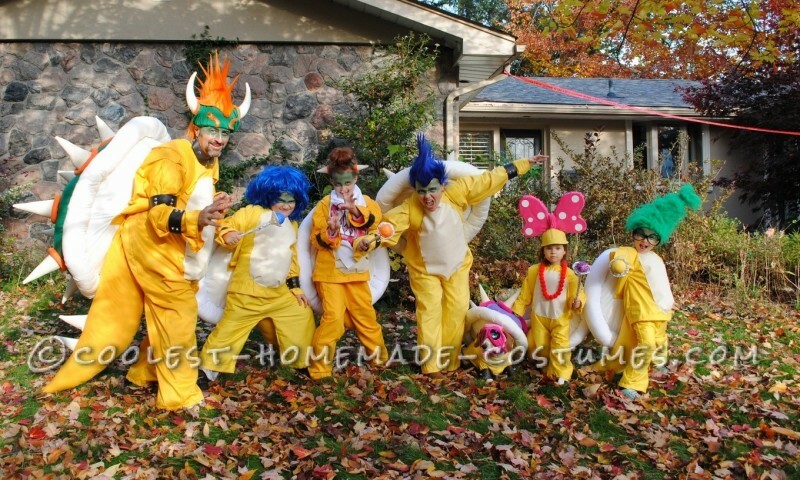 So much fun and it’s about time some of the other Koopalings get recognition too. They all deserve it!